The sharper driving dynamics of New Sorento are also down to the major changes introduced to the suspension, steering and brakes. While the basic suspension layout of MacPherson struts at the front and an independent multi-link arrangement at the rear has been retained, a new H-shaped front subframe and an additional reinforcement at the rear have improved straight-line stability and ride comfort and raised road holding through more precise tyre contact with the road. New high-performance dampers at all four corners, larger suspension bushes and longer trailing arms at the rear also add to New Sorento’s greater levels of comfort. 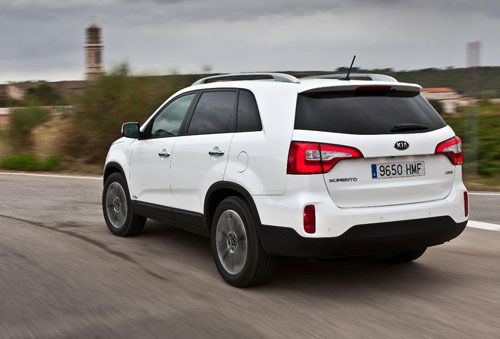 The hydraulic power steering system on the outgoing model has given way to Kia’s widely used Motor Driven Power Steering (MDPS) in New Sorento. This saves fuel by drawing power from the engine only when the car is turning and improves agility thanks to a lower steering gear ratio. The Kia Flex-Steer system, which allows the driver to choose between Normal, Sport and Comfort levels of assistance according to where and how the car is being driven, is fitted to the range-topping ‘KX-3’ model. The 18-inch alloy wheels which are standard on’ KX-3’ are now 7.5 inches rather than 7 inches wide, increasing the contact patch on the road for greater traction and turning capability. They also help to improve stopping power, which benefits further from the larger front brake discs now fitted to all models. 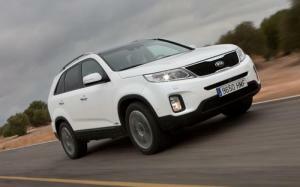 New Sorento requires up to 2.6 metres less than its predecessor to come to rest from 62 mph. 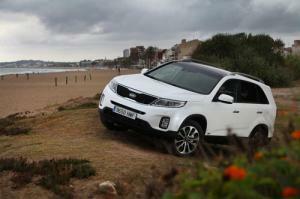 The suspension revisions also contribute to New Sorento’s greater refinement. In addition, a three-layer dash pad, a tunnel insulator and a redesigned wind deflector ahead of the panorama roof fitted to ‘KX-3’ help to reduce vibrations, boom and road noise entering the cabin – what engineers refer to as noise, vibration and harshness (NVH). All versions of New Sorento are now powered by a revised version of Kia’s 2.2-litre CRDi turbodiesel engine, driving all four wheels via a six-speed manual gearbox or the company’s’ six-speed automatic. A new exhaust-gas recirculation system has helped New Sorento achieve class-leading fuel economy and CO2 emissions of 47.9 mpg and 155 g/km (manual) – improvements of 5.7 mpg and 22 g/km over the outgoing model, which in turn rewards buyers with a saving of £155 in the first year’s road tax (VED). The figures for New Sorento with the six-speed automatic transmission – still one of only a few to be completely designed, engineered and built in-house in the global auto industry – are 42.2 mpg and 175 g/km with the 17-inch wheels fitted to the majority of models, or 41.5 mpg and 178 g/km for KX-3 with 18-inch wheels. These represent reductions of up to 4 mpg and 19 g/km. Automatic versions of New Sorento have Kia’s Active ECO feature which adjusts the operation of the engine and transmission to promote maximum fuel economy. The new platform which underpins New Sorento has improved space for passengers in rows two and three without any increase in the car’s overall footprint or wheelbase. In the middle row there is an extra 30 mm of knee room and for occupants of the two rearmost seats an extra 9 mm of knee space. All occupants benefit from more luxurious surroundings, with notable improvements in the soft-touch materials used to trim the cabin and higher levels of equipment for all four trim grades – ‘KX-1’, ‘KX-2’, ‘KX-2 Sat-Nav’ and ‘KX-3’. Leather is used to trim the steering wheel of every model, the door pillars (except ‘KX-1’) and extendable sun visors are cloth-lined and chrome has been applied around the cabin as a garnish, while a wood grain finish on the ‘KX-1’ and ‘KX-2’ and metal inserts on the ‘KX-3’ have been added to the dash and door trims, giving New Sorento a premium look and feel. All versions apart from ‘KX-1’ have ambient lighting in the front centre console and door trims and every model has door sill scuff plates – aluminium on the two ‘KX-2’ models and aluminium with front illumination on ‘KX-3’. In ‘KX-3’ the standard three-dial instrument cluster has been replaced by a 7-inch TFT LCD multi-function high-definition display. In all models dual-zone automatic climate control with rear-seat air ventilation is fitted, allowing all occupants to fine-tune the temperature in their area of the cabin. The new front centre console features flexible cup holders with a sliding cover, while the re-designed gearshifters of New Sorento leave more space for storing small items. A slightly smaller boot of between 116 litres (seven seats upright) and 1,530 litres (all rear seats folded) includes an under-floor storage tray and power outlet. ‘KX-2’ and ‘KX-3’ variants have a luggage net. ‘KX-2’ versions additionally now have rain-sensing front wipers, a leather-trimmed instrument panel and a 4.3-inch LCD colour touch-screen with reversing sensors. The ‘KX-2 Sat-Nav’ version adds a seven inch touch-screen navigation system with European mapping and Traffic Messaging Channel (TMC) while the luxurious ‘KX-3’ model also has the panoramic sunroof, Xenon adaptive front lighting with automatic levelling, an eight-way power-adjustable driver’s seat and a four-way power-adjustable front passenger seat, ventilated front seats, heated outer rear seats, a heated steering wheel, a multi-function full colour display and the Flex-Steer. The satellite navigation system is combined with a 10-speaker premium audio system delivering 495 watts of power. It includes a central speaker, external amplifier, sub-woofer and an 11-channel DSP amplifier for maximum surround-sound quality. When Kia began designing the second-generation Sorento it took into account that SUV buyers are younger, increasingly likely to be female and often wealthy urbanites who want the car for family use rather than the traditional country lifestyle. New Sorento builds on the sophistication, refinement, design and quality of the outgoing model while preserving the air of solidity and safety that has always been one of its greatest attributes, with its towing capabilities remaining at up to 2,500kgs. The new front end has an even stronger but more modern appearance, with a simple moulding and greater body-coloured areas – including the new bumpers, which help to emphasise the high-tech detailing of the latest lamp units. Careful attention to surface detailing has reduced aerodynamic drag. All models now have projection headlights and LED daytime running lamps. The tailgate has been completely redesigned to give New Sorento a more high-tech appearance and visually stretch the width, while the new body-coloured bumpers include a step which adds to the robust image. Redesigned rear lights – LED on ‘KX-3’ – add a touch of extra sportiness to Kia’s large Sports Utility Vehicle. New Sorento’s look of solidity and strength is more than matched by the safety it delivers. The safety specification is uniform across the range. Particular attention was paid to the B-pillar areas, where a roll-over hoop is incorporated and ultra-high-strength steel made by the hot-stamping method is used in the side sills and the floor and dash cross members plus the fuel-tank surround. Additional side impact protection is provided by the absorbent interior door trim panels. Every Sorento has anti-lock brakes (ABS) with Electronic Brake-force Distribution (EBD) to allow drivers to steer and brake simultaneously in emergencies and to ensure the stopping effort is directed to the wheels with most grip. A flashing LED Emergency Stop Signal (ESS) is also fitted to warn following motorists if the driver has to brake rapidly or severely. 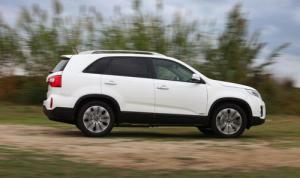 New Sorento also has Electronic Stability Control (ESC) featuring Downhill Brake Control (DBC). Vehicle Stability Management (VSM) connects to the ESC and steering system to automatically correct any tendency to under steer or over steer by braking individual wheels, reducing engine torque or both. DBC maintains a steady speed of 5mph on steep descents. There is also Hill-start Assist Control (HAC) to prevent wheel-spin or roll-back when setting off on steep or slippery upslopes. Six airbags (twin front, side and side curtains) are standard, as are active front headrests that prevent or minimise whiplash injuries should the Sorento be hit from behind. There are also front seatbelt pre-tensioners and load limiters. New Sorento, like every other Kia, benefits from a seven-year or 100,000-mile warranty.